SnowWolf’s QuattroPlowHD combines four functions into one attachment with no extra harnesses or controllers. SnowWolf has introduced the QuattroPlowHD, a highly versatile snow plow for heavy equipment such as wheel loaders, tractors and backhoes. The QuattroPlowHD is a larger version of the QuattroPlow, which SnowWolf introduced in 2016 for skid steers, compact wheel loaders and smaller tractors. Like the QuattroPlow, the QuattroPlowHD gives operators the power to efficiently tackle four distinct functions with one piece of equipment. It's a high-capacity, hydraulic angle snowpusher, angle plow with wings, wide-angle plow with wings and backdrag plow, all in one. The QuattroPlowHD is available in 10- and 12-ft. (3 or 3.6 m) lengths. When the wings are fully extended on the 12-ft. plow, it is 17 ft. (5 m) wide. The moldboard is 38 in. (96.5 cm) tall compared to the QuattroPlow's 30 in. (76 cm), and it weighs 280 lbs. per foot compared to 140 lbs. per foot for the smaller attachment. 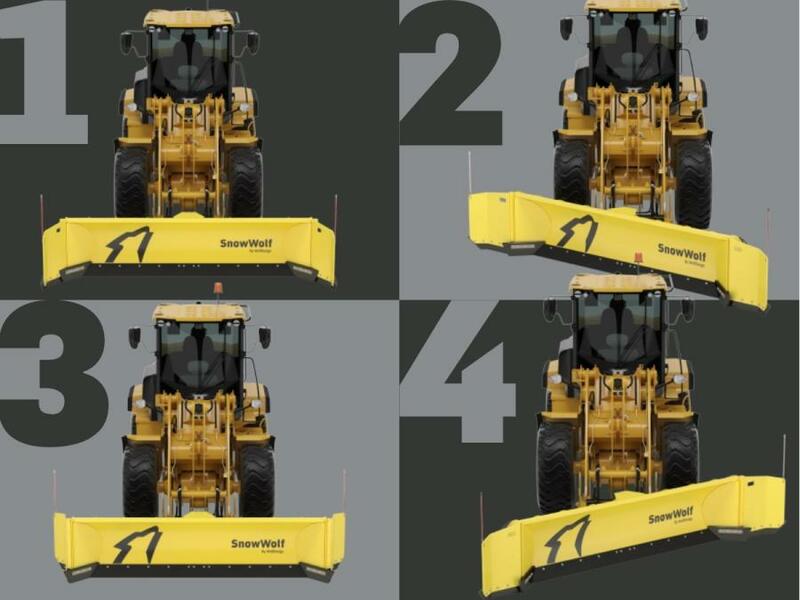 The attachment's wings rotate 165 degrees to make it a high-capacity hydraulic snowpusher when they are all the way forward, and when they're all the way back it is an efficient straight or angle plow with wings or backdrag plow with significant containment and down pressure. A hydraulic smart valve gives operators complete control of the wings without removing their hands from the steering controls. When they angle the plow all the way to the right and hold for a few seconds, the smart valve shifts hydraulic fluid to the wing circuit and both wings move forward to the snowpusher position. When they angle all the way to the left and hold, the wings move backward to the wing plowing or backdragging positions. The directions can be switched according to operator preference. In the backdrag position, the QuattroPlowHD carries significantly more snow than an angle plow alone. Operators also can scrape and carry snow effectively backward without changing the machine's orientation. SnowWolf also incorporated 35-degree-angle tips on the QuattroPlowHD's wings to provide greater carrying capacity while minimizing windrows caused by trickling from the ends of the plow, regardless of the direction the machine is moving. Like all SnowWolf plow attachments, the QuattroPlowHD can oscillate up to 14 in. (35.5 cm) from level so the moldboard can follow contours of the ground and remain in full contact with the surface nearly 100 percent of the time. This provides a clean scrape and reduces the amount of salt that needs to be applied. Additional innovations give the QuattroPlowHD exceptional handling and clearing effectiveness, and a new, interchangeable system makes it easy to attach it to multiple machines with different mount styles. The QuattroPlowHD is a fully floating or full down-pressure system, depending on the conditions and an operator's preferences. When it's in full-floating mode, the plow moves up or down due to horizontal bars that move forward or back through slightly arched slots in plates that are attached to the frame behind the moldboard. Because it weighs approximately 2,850 to 3,150 lbs. (1,292 to 1,429 kg), the QuattroPlowHD generally doesn't require down pressure to effectively move snow and scrape a surface. However, if necessary, an operator can apply full down pressure by rotating the mount all the way forward. The user-friendly system also eliminates the need for an operator to tilt and level the blade repeatedly to ensure it is hitting the surface correctly after setting it down. With a loader, for example, the operator can program the return-to-dig circuit to lower and stop at the same elevation every time. The frame will be centered midway through the slots and the plow will float up or down, up to 4 in. (10 cm) either way, to follow the contours of the parking lot without any operator input. The new system also eliminates premature and uneven wear to the cutting edge. Because the rigid system required full down pressure at all times, the cutting edge wore faster overall and some sections wore faster still because the full blade wasn't always in complete contact with the surface. SnowWolf has reduced the distance from the cutting edge to the back of the attachment on the QuattroPlowHD by over a foot as compared to its largest plow attachment, the AlphaPlow. The adjustment makes for a tighter turn radius, provides better overall maneuverability and reduces stress on the host machine's components. A new, interchangeable mounting system makes it quick and easy for a dealer, contractor or fleet manager to move a QuattroPlowHD from one machine to another, either for different jobs or when a machine is replaced. This eliminates the need to buy a new frame for each machine. The system consists of machine-specific hooks that connect to a host machine's mounting plate. To change from one style to another (i.e., one machine to another), the user removes four bolts, two on each side of the frame, slides one set of hooks off of the frame, slides a different set of hooks back on and replaces the bolts. The frame remains the same regardless of a machine's mounting plate style. SnowWolf has designed and manufactured hooks that connect to four different mounting plate styles: 3-Point hitch mount, CAT-IT mount, Cat fusion mount and JRB mount.